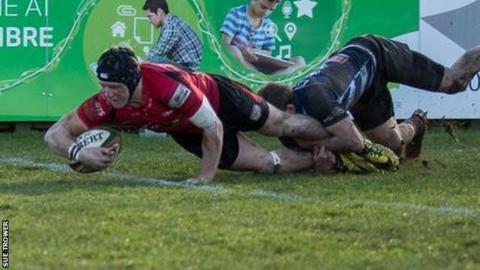 Jersey head coach Harvey Biljon says his side's upturn in form is down to the squad giving up a week off. The islanders are unbeaten in four games, their best run of form since being promoted to the Championship in the summer of 2012. "We had an opportunity to have a week off," Biljon told BBC Radio Jersey. "But the players themselves decided to come in and work hard to make sure we turn around what was happening earlier on in the season." Jersey have beaten Doncaster, Nottingham and Bedford, as well as drawing at Rotherham, in their last four games. Jersey had lost eight games in succession before they beat Doncaster on 17 January. The club's on Saturday ensured their highest-ever Championship points tally with seven games left in the season. Biljon's side are currently sixth in the 12-team league, having finished 11th in their previous two campaigns. "What we've got to do is continue with this momentum and make sure we can front up when we go down to Plymouth next week," added Biljon. "I'm not going to look at how many points we've scored, I'm going to look at how many points we can go and score between now and the end of the season."